Happy March! Today is actually my mom’s birthday, so Happy Birthday to her! 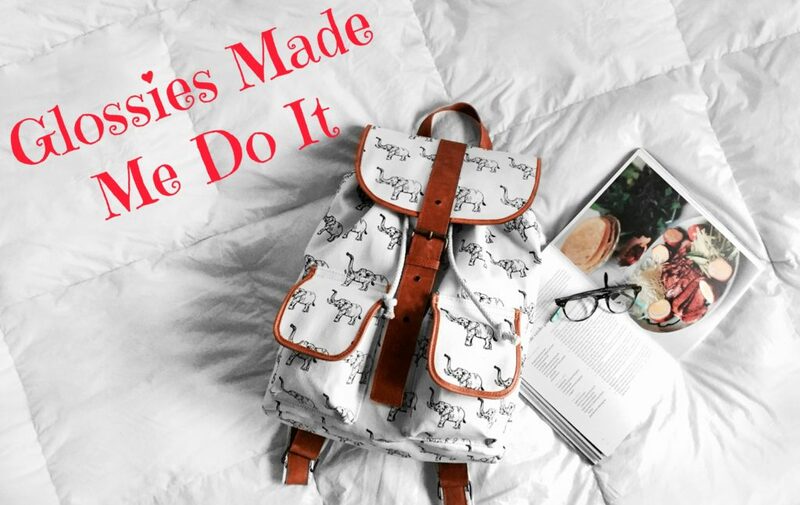 It’s time for the March 2019 edition of Glossies Made Me Do It, which I co-host with Ashley. Has a magazine made you do anything lately? Try a recipe? Read a book? Have a discussion? Write a post and link up with us below! For this month, I found an article in the March 2019 issue of Cosmo that I wanted to discuss. If you’re looking for the magazine, it has the lovely Lana Condor on the cover! So You Want To Be My Bridesmaid? 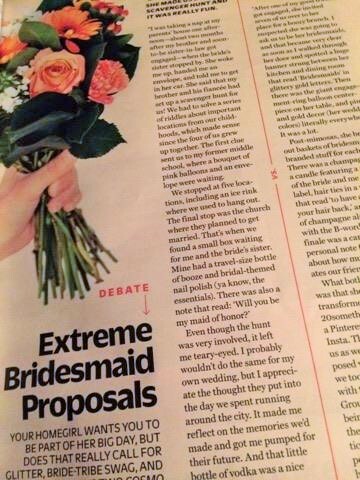 There is an article in this issue called Extreme Bridesmaid Proposals and two different women talk about the elaborate way they were asked to be in a friend’s wedding – the first person loved it, and the second one thought it was more for Instagram photos and she didn’t feel it needed to be as big of a deal. I don’t mind that my friends didn’t do that much when they asked me, but whenever I get married, I want to do something a bit more exciting. There are always cute ideas on Pinterest and my sister’s been asked in really sweet ways. It doesn’t need to be a huge party (or scavenger hunt, like one of the examples in the magazine), but I do like the idea of a sweet note and a little gift. Just something to show you truly care about the person and appreciate them being in your wedding. What do you think? If you’re married, how did you ask people to be in your wedding? Do you like elaborate ideas, or more low-key ones? And remember- if you have a Glossies post, please link up below. We have these on the first Friday of every month! When I asked my bff to be my maid of honor, I turned to her and asked, without even giving it any though! lol. Of course, this was way before the Pinterest days! As someone who had her best friend in college not even ask her to be a bridesmaid, and then having been bridesmaid for family members in the past and others, I’m okay with a low key request. To me it seems so much over the top to do big proposals for this. I do enjoy when people do funny surprises to tell people that they’re engaged. That’s fun. Of course I’m kind of an introvert, so probably that could be why I wouldn’t want the big proposal. Fun post! I think asking in a special way is cute and very nice, though! I guess I never really thought about it when I got married, but now I do wish I would have done something. Even something like a card is really sweet. I’ve been asked over lunch. I’ve been drunkenly asked late at night. I’ve been asked in a sweet letter. I’ve been asked with a card and little goodie bag that contained the nail polish I was supposed to wear as well as some self-care items. Hmmm… I think that’s all the times I’ve been asked. I just asked my girls, probably on the phone or something, it wasn’t anything huge. I think it’s a fun idea to do something special though and with so many fun ideas out there now if I were getting married now, maybe I would. I did something little, but my girls and brother already expected it, so it wasn’t a huge deal. I got each of them a little navy blue paper bag which held little champagne bottles and blue hair ties for the girls, and a bud light tall can (no idea what the ounces were) for my brother. The highlight of the little package were the handmade cards that I ordered for each of them from Etsy. Each card fit each person’s personality and I had SO much fun shopping for the right card and then writing a littler personal blurb in them. I’ve never been a bridesmaid and when I got married we went super low-key so I didn’t have any bridesmaids! However, I find the elaborate stuff utterly ridiculous. I mean, make it special if that’s your thing, but doing stuff ‘just for the pictures’ is getting on my nerves. I never did a bridesmaid proposal but thinking back I wish I did one. Bridesmaid proposals weren’t really a thing way back when I got married, but if they were, I would totally have done them. LOL yeah I’m definitely on side two. I think the over the top stuff is a bit ridiculous for things like this or prom. I definitely prefer the low-key proposals. There is so much going on with a wedding anyway, who needs more?! Guess this goes along with asking dates to the prom and homecoming in a big way. Kind of fun. But I would probably prefer something low-key, myself. Wouldn’t want the proposal or invitation to overshadow the event! Happy belated birthday to your mom! I’ve never been asked in an elaborate way but was okay with it. I suppose it’s “to each their own”. I was my sister’s maid of honor, when I was in college, so my mom paid for everything, and I had moved out of state after college, and kind of dodged most of the wedding party invites. I was asked to be a bridesmaid for my sorority little sister, and I was honored, but as the costs kept escalating, I had to bow out. Travel and hotel expense, rental cars, and $350+ dress is asking a lot. And, don’t get me started on all these OTT proposal type things. Everything is all for show these days, and the more elaborate they make it, the less sincere it seems to me. I love this idea! I am actually not a huge fan of elaborate weddings, I do think that it is important to show appreciation to friends and family that are going to be a part of your big day. Gosh I didn’t even know this was a thing. I think it sounds kind of fun, but it should be sincere and not just for photos. I’ve only been in my cousin’s wedding, I think she just asked us in person when she told us she got engaged. it was not a big deal. I got married a long time ago, I don’t think I did anything really exciting to ask the girls! I read this while taking a bubble bath because that is my jam, and I was SO annoyed by the second, complain-y person! Like okay, I get if it isn’t really your cup of tea, but girl, she was just asking you to be in her wedding and giving you gifts, what even!? I don’t think I’d personally do it because I do find it a little hokey but I certainly wouldn’t judge anyone else- I think it’s sweet that they want their friends to know how much they care!